Active layer thickness (ALT) is a critical parameter for monitoring the status of permafrost that is typically measured at specific locations using probing, in situ temperature sensors, or other ground-based observations. The thickness of the active layer is the average annual thaw depth, in permafrost areas, due to solar heating of the surface. This data set includes the mean Remotely Sensed Active Layer Thickness (ReSALT) over years 2006 to 2011 for the region near Barrow, Alaska. The data were produced by an Interferometric Synthetic Aperture Radar (InSAR) technique that measures seasonal surface subsidence and infers ALT. ReSALT estimates were validated by comparison with ground-based ALT obtained using probing and Ground Penetrating Radar at multiple sites. 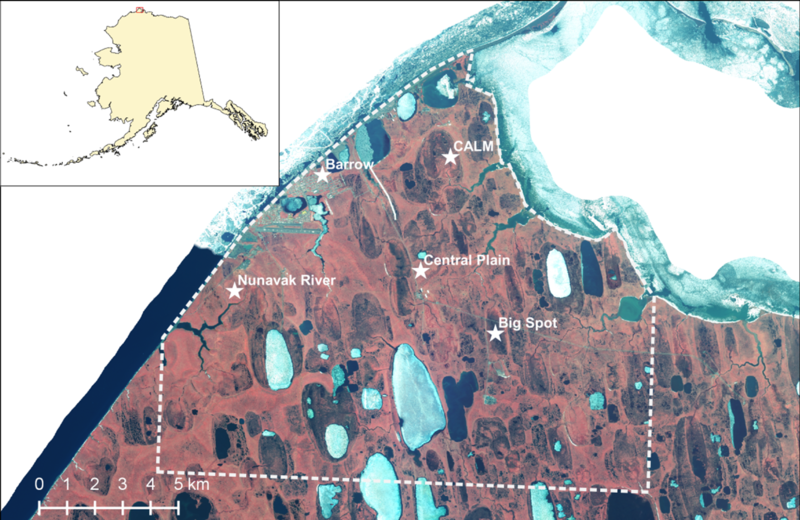 These results indicate remote sensing techniques based on InSAR could be an effective way to measure and monitor ALT over large areas on the Arctic coastal plain. These data provide gridded (30-m) estimates of active layer thickness (cm; ALT) and seasonal subsidence (cm), as well as calculated uncertainty in each of these parameters. This data set was developed in support of NASA's Arctic-Boreal Vulnerability Experiment (ABoVE) field campaign. 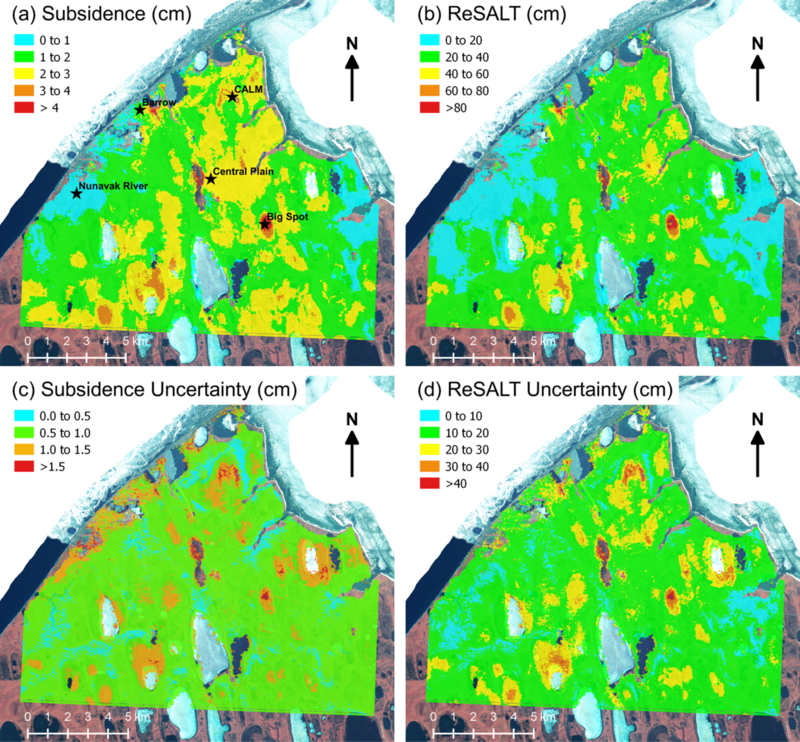 Figure 1: The remotely sensed seasonal subsidence (a), ReSALT (b) and associated uncertainties (c and d). Locations with no coherent signal are left transparent. Panel (a) shows the four validation sites (from Fig. 3 in Schaefer et al. 2015). Grid cells at 30-m resolution. The input InSAR data were collected between 2006-01-01 and 2011-12-31. The ReSALT data represent a time-averaged estimate of ALT from 2006-2011. ReSALT_barrow.txt companion file Same data as above in vector polygon format. Active layer thickness (ALT) is a critical parameter for monitoring the status of permafrost that is typically measured at specific locations using probing, in situ temperature sensors, or other ground-based observations. Remote sensing offers the possibility of measuring ALT over large, inaccessible areas to complement in situ measurements. The investigators found that the ReSALT retrieval algorithm accurately estimates the time-average ALT (2006-2011) within the uncertainty of in situ observations in undisturbed tundra and drained thermokarst lake basins representing ~76% of the area around Barrow over the period covered by the ALOS PALSAR data: 2006-2011. The spatial resolution and coverage of ReSALT make it useful in any application requiring knowledge of the spatial distribution of ALT, from validation of models to evaluation of risks to human infrastructure. The investigators included estimates of uncertainty in the ReSALT data product. Sources of uncertainty include: uncertainty in the in situ probe active layer thickness (ALT) data, spatial representation error, and uncertainty due to the fact that the ground penetrating radar (GPR) measurement represents the ALT for 2013 only while the ReSALT product represents the 2006-2011 average ALT. ReSALT was less than observed ALT in ~22% of the study area with well-drained soils and in ~1% of the area where soils contained gravel. ReSALT was greater than observed ALT in some drained thermokarst lake basins representing ~1% of the area. InSAR uses phase differences between Synthetic Aperture Radar (SAR) images acquired at different times to produce interferograms that map surface deformation in the radar line-of-sight direction. To measure the seasonal subsidence with InSAR, the investigators first collected Phased Array type L-band Synthetic Aperture Radar (PALSAR) scenes from the Advanced Land Observation Satellite (ALOS) for the Barrow, Alaska domain. Liu et al. (2012) described the ReSALT retrieval algorithm in detail. Raw PALSAR data were processed into focused SAR images and interferograms were formed from pairs of co-registered SAR scenes. Zebker et al. (2010) describe the processing routines in detail. The investigators used a total of 9 PALSAR scenes between 2006 and 2011 and formed 20 interferograms with good coherence and without contamination by obvious ionospheric artifacts. They solved for long-term average seasonal subsidence and active layer thickness from the 20 interferograms using least squares regression. Figure 2: Google Earth Image of the ReSALT domain around Barrow, Alaska (dashed line) and the locations of the four validation sites (from Fig. 1 in Schaefer et al. 2015). For validation of the ReSALT data, the investigators selected four sites representing a range of environmental conditions commonly observed in the Barrow area (Figure 2). Mean probe ALT measurements from 1995 to 2013 were projected onto the corresponding ReSALT pixels. They also collected a total of ~15 km of ALT measurements using 500 MHz GPR and ~1.5 km of probing data at the four validation sites in August of 2013 to compare with ReSALT. GPR technology has a long history of measuring ALT with acceptable accuracy in comparison with ALT probe data. The GPR traces were projected onto the InSAR pixels by calculating the average of all GPR traces in each pixel along the GPR tracks. See Schaefer et al. (2015) for more details. Schaefer, K., L. Liu, A. Parsekian, E. Jafarov, A. Chen, T. Zhang, A. Gusmeroli, S. Panda, H.A. Zebker, and T. Schaefer. 2015. Remotely Sensed Active Layer Thickness (ReSALT) at Barrow, Alaska using Interferometric Synthetic Aperture Radar. Remote Sens. In Press. Zebker, H.A., S. Hensley, P. Shanker, and C. Wortham. 2010. Geodetically Accurate InSAR Data Processor, IEEE Transactions on Geoscience and Remote Sensing, 48 (12), 4309–4321. doi: 10.1109/TGRS.2010.2051333.